Once upon a time, I used to enjoy spending lots of time experimenting in the kitchen. I had fabulous cookbooks in which I found interesting and challenging recipes to make for dinner. On a weekday. And then it was over. My kids started playing team sports. Do you know this new life? Are you driving to some field at exactly the same time you should be soaking and sauteeing or poaching and shredding? And then back an hour later to pick-up, unless of course there’s a GAME. Then you’re sitting on bleachers for two hours trying to figure out how dinner will be ready the second you walk in the door with starving children. 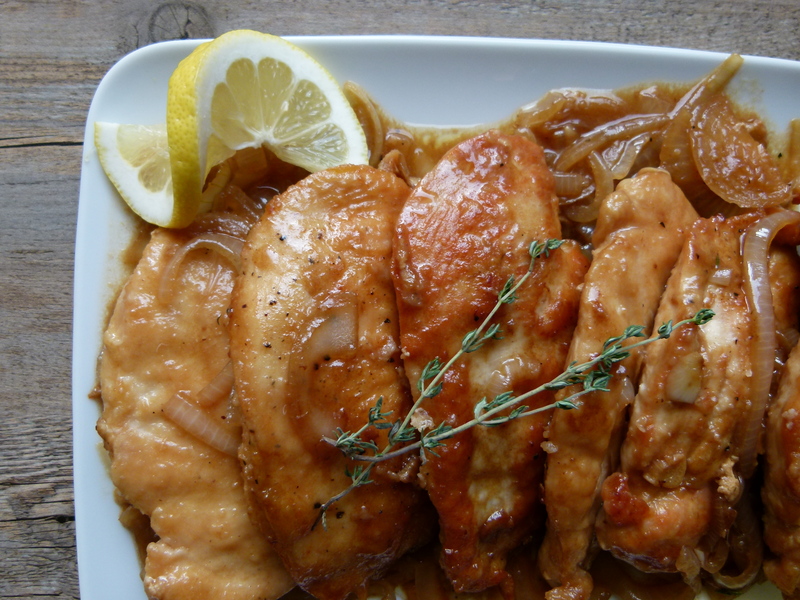 “Baked Lemon Chicken” from The Union Square Cafe Cookbook was one of my favorite chicken entrees before sports. Bone-in chicken pieces baked with lots of sauteed onions, lemon and thyme. It was even good enough to serve to company. But there would be no more basting every 15 minutes for me on a Tuesday at 5:00. So what’s a girl to do? Adjust the recipe to cutlets, of course! Season the chicken cutlets on both sides with sea salt and black pepper. Dredge them with flour and shake off the excess. Warm about ¼ cup olive oil over medium heat in a large skillet. Add the chicken cutlets and sauté on both sides until golden brown. Transfer the chicken to a plate. Add the onions and garlic to the skillet and season with sea salt and pepper. Sauté until tender, about 8 minutes. Pour the lemon juice into the pan and scrape any brown bits on the bottom. Add the chicken stock and thyme sprigs and bring to a simmer. Transfer the chicken back to the pan with any accumulated juices. Simmer until cooked through, about 5 minutes. Remove thyme sprigs and serve immediately. « pamela highlighted as a food guru on time inc.’s new website, fashion etc. Making this recipe tonight for sure! Question: I’ll have 6 pieces of chicken (same as you have pictured), which obviously cannot all fit in the same skillet at the same time. 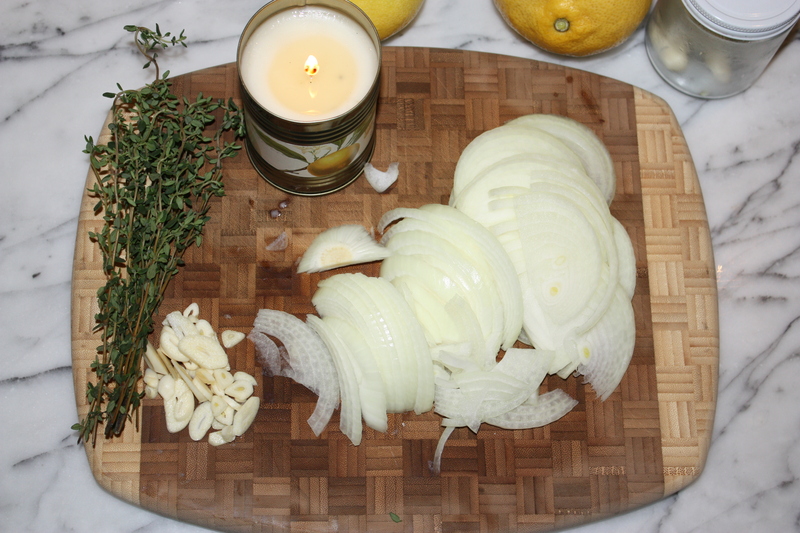 Do you cook it in batches (with 1/2 the onions & garlic each time), or do you use 2 skillets? Also, would you recommend non-stick or stainless steel skillets? Thank you! I would recommend browning the chicken in batches in one skillet (less clean up) and if there is room to start the onions with the last batch of chicken, do so. Just push all the chicken to one side and start the onions on the other side. I prefer stainless steel. Enjoy! Thanks for the feedback, Monica! You know I always appreciate it. I could see how someone who doesn’t like lemon wouldn’t love this recipe. But he’s a good guy for indulging you. This looks delicious ! I love lemon chicken and I think I just might make it this week! It looks like you have spaghetti squash in the picture too, which also looks delish! Do you know what you put in the spaghetti squash for flavor ( I see what I think is maybe parsley)? My favorite! My family loves this…serve it over brown rice and arugula. Yum! One of my staples for the last 20 years, truly! Winner! My son was so excited about this dish last night. He asked me what i was trying next. I was very happy to have some left over so that I could take it to lunch. I shared with two colleagues who immediately printed out the recipe and were making it for dinner tonight. I did get into a little bit of trouble when my son realized i took some for lunch! So delicious and truly easy to make! I’m so glad you both enjoyed it! I just made it (again) for company this weekend — always a hit! has liked them! Especially plesed to see you use Bob’s Red Mill products as I shop at their mill store here in the Northwest. Happy to have you, Cathy! I hope you made the Lemon-Thyme Chicken — it’s one of my favorites. Made it last night. Made the pumpkin and sauted apple pancakes last Saturday morning, the pumpkin muffins and the swiss chard w/ apricots and pinenuts mid-week and oh yes, the chocolate covered frozen bananas (am I bananas?)! Plus my husband had no clue I switched to whole wheat pastry and white whole wheat bread in many recipes! Wow! You’re out of control — I love it! That whole wheat pastry flour is genius, no? I love this recipe. As I am always looking to save time- 2 questions- do you ever use lemon juice in bottle or always fresh squeezed? Can you put it all in a dish and bake/ roast it? Such good questions! I never use bottled lemon juice — I don’t think the taste compares to fresh. In fact, I think it tastes terrible. For the second question, you would still need to brown your chicken cutlets and saute the onions first, otherwise you’ll be poaching the chicken and the onions and the flavor will not be the same. Since you shouldn’t skip those steps, you won’t be saving any time by finishing it in the oven. I made this dish for Easter Sunday and it was a HUGE hit! Everyone loved it. I actually added lemon zest to the chicken while it was cooking with the broth, lemon juice and herbs. The zest gave it a nice kick. Even my mother-law complimented me on this dish! Thank you Pamela! 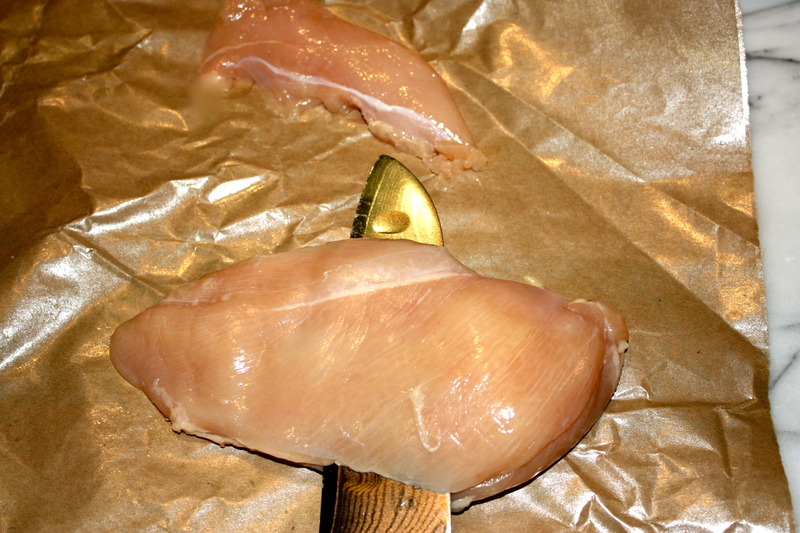 I just tried this recipe yesterday because I am not a big chicken breast fan. In fact, when I go to my mother’s house she knows she has to buy chicken on the bone. I find breast meat to have zero taste. But this recipe really changed my mind. So good!! My husband loved it. It is now going be our Tuesday night dinner. It was also really easy and quick to make. A must in this household! Ironically, this recipe evolved from a bone-in version, but I needed to speed it up for busy weeknights. Thanks for the feedback! Wow this was phenomenal!!! I had it for dinner and then for breakfast the next day, it was that good! I’m a big fan of savory for breakfast! OMG! Donna made this chicken tonight and we all can’t get enough of it. so flavorful, zesty and delicious. 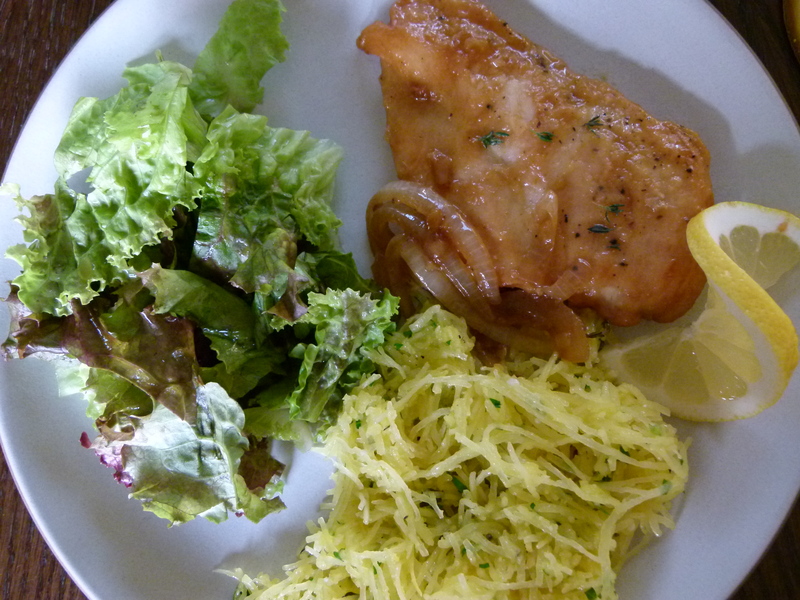 Plus we had your kale salad at lunch and I had two helpings…keep the recipes coming…especially entrees. Will do! Stay tuned for more! I love this chicken dish. This is the second time I made it. I usually don’t like onions but they tasted delicious with the chicken. My kids loved the chicken and my picky husband loved it too. That’s a big compliment to you because my husband does not like to try many recipes. I don’t have the picky son but I do have the picky husband! Your comment made me laugh! I’m glad your husband is braving new frontiers. Thanks. Favorite dish in our home! I LOVE the flavor and simplicity. The onions are a great additive. My husband and I really liked this. Great lemon flavor! Glad you liked it! It might be my favorite quick chicken dish. I made this for my dad’s birthday and it was a huge hit. Though what was an even bigger hit was giving my dad the gift of one of pamela’s classes. My dad has now been to several classes and he is eating much healthier and now we have a common understanding of what is healthy. ( he used to think eating green beans out of a can was healthy). Thanks Pamela for transforming not only my eating habits though my whole family’s habits!!! You are the best. Thank you, Lisa. Your family is lucky to have you! This is a wonderfully easy and delicious recipe. I enhanced the lemon flavor somewhat by sprinkling the zest of one lemon over the dish before serving. I hadn’t thought of adding zest to the dish. I must try that. Thanks! I just made this for dinner and it was hit will my entire family. I really enjoy reading your website. In fact, I have made it my homepage! I find the recipes easy to follow and I particularly enjoy the anecdotes about your family. I’m so glad the chicken was a hit! More family-pleasing recipes to come! My kids love lemon and this recipe is so easy to make! I prepped the chicken and onions ahead of time and just quickly sauteed them together after arriving home late from their tennis lessons. Thanks! 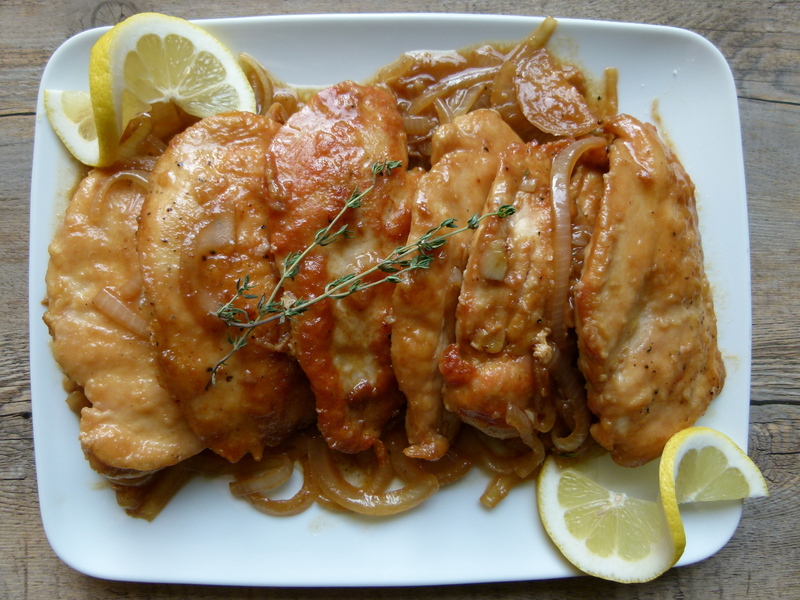 This is an incredibly moist and flavorful chicken dish made even more so with the onions. It’s elegant enough to serve at a fancy dinner! Yum!